Please note, the Department of Health Clean Air Branch has been designated as the official source of information about vog. Be sure to visit their periodically updated website for the latest recommendations concerning vog mitigation. When a volcano erupts, it produces molten lava in various forms, but the driving force for the eruption comes from the gases that are contained in the lava. These gases come out of the molten rock at varying pressures and consist of: water vapor, carbon dioxide, sulfur dioxide (SO2), hydrogen, and a variety of other acids (sulfuric, hydrochloric, and hydrofluoric acids) and inert gases. Scientists working near the vent must wear gas masks to protect themselves from the concentrated fumes. Once these gases enter the atmosphere, many react very quickly. Sulfuric acid aerosols (from sulfur dioxide) produce the fume clouds that are carried by the wind and become dispersed into an unpleasant cloud of vog (from the words "volcanic" and "smog"). Over time, the gases continue to react with the atmosphere and ultimately form aerosols of ammonium sulfate that are gradually washed out of the atmosphere by rainfall or a process of settling called dry deposition. Vog is unpleasant to anyone, and can produce headaches as well as irritation to the lungs and eyes at higher concentrations. For people with asthma and other respiratory problems, the effects are much more serious, causing a tightening of the airways in the lungs and making it very difficult to breathe. Studies are being done to learn the long-term effects of vog but, to date, there’s been no clear evidence that vog causes lingering damage to normally healthy individuals. However, a number of strategies can be used to minimize your exposure to vog’s irritations: when possible, stay indoors with windows and doors closed and sealed. If you have one available to you, use an air conditioner or even a dehumidifier; both will condense water out of the indoor air and, in doing so, will remove the particulate sulfur compounds and acid gases from your indoor air. 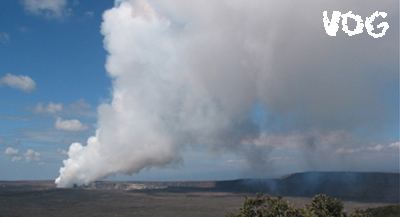 Currently, Puʻu Ōʻō emits around 2,000 tonnes of SO2 per day, and some of the fumes blow into populated areas. On a trade wind day, northeast winds blow Kīlauea’s gases toward the southwest areas of the island and across the ocean, but then thermally-generated winds (caused by Maunaloa and Maunakea heating up during sunlight hours) draw the vog back into a large eddy system offshore of the district of Kona. During daylight hours the vog is brought ashore and upslope on the flanks of Maunaloa and Hualālai; at night, offshore breezes carry it back out to sea. When the wind blows from the south, Kona enjoys clean air, and Hilo suffers. Because Hilo is so much closer to the erupting vents, there is less time for the vog to become dispersed and react with the atmosphere and, as a result, it contains higher concentrations of sulfur dioxide and sulfuric acid aerosols than are found in Kona, and is correspondingly more unpleasant. In extreme cases, visibility in East Hawaiʻi is less than a couple of miles. When winds are light and variable, the vog accumulates in areas closest to the emitting vents: near Puʻu Ōʻō, communities such as Mountain View and Glenwood see high concentrations of vog. For centuries, Halemaʻumaʻu Crater at the summit of Kīlauea has been emitting volcanic gases that include carbon dioxide, sulfur dioxide (SO2), hydrochloric acid, and a variety of other trace gases. During recent decades, the rate of discharge of sulfur (and the other gases) has varied: during the 1970’s, when Mauna Ulu and several other short-lived eruptions were occurring at Kīlauea’s summit, large amounts of gases (including sulfur dioxide) were discharged through Halemaʻumaʻu crater and several vents extending toward Keanakākoʻi. The average SO2 emissions from Kīlauea’s summit, from 1997 through the first half of 2007, were around 120 metric tonnes per day. However, on March 11, 2008, a new fumarole formed on the floor of Halemaʻumaʻu that increased the sulfur production to an estimated 2,000 - 2,500 tonnes per day. By mid-April, SO2 production had decreased to around 800 tonnes per day. 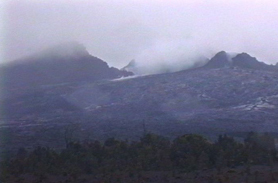 The plume of volcanic gas can be seen on the Hawaiian Volcano Observatory’s web cam. 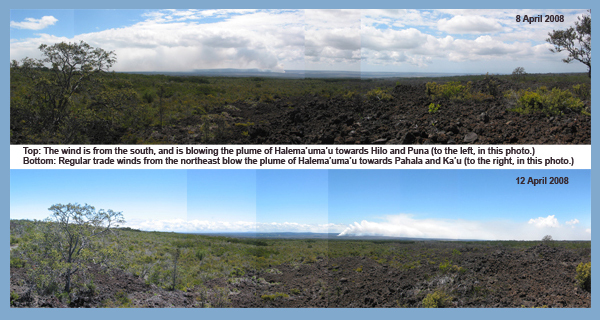 Top: The wind is from the south, and is blowing the plume of Halemaʻumaʻu towards Hilo and Puna (to the left, in this photo). Bottom: Regular trade winds from the northeast blow the plume of Halemaʻumaʻu towards Pāhala and Kaʻū (to the right, in this photo). Big Island residents are already familiar with vog from Puʻu Ōʻō, which affects different areas of the island depending on wind direction. The vog from Halemaʻumaʻu, likewise, is carried by the wind to a variety of locations, and the direction of the wind is critical. Halemaʻumaʻu is very close to offices and commercial venues within Hawaiʻi Volcanoes National Park, and only a couple of miles away from Volcano Village. During calm winds, the plume from Halemaʻumaʻu could impact these nearby communities; during southerly winds, the plume could affect much of East Hawaiʻi; and during trade winds, areas in Ka’ū (Pāhala, Nāʻālehu, Waiʻōhinu) have been heavily impacted, especially when the particulates get caught in an eddy system and remain in the area instead of being blown out to sea. SO2 is a very reactive gas that can cause severe irritation in populations that are sensitive to it. It is soluble in water and forms a weakly acidic solution (sulfurous acid), and easily combines with atmospheric oxygen to form sulfuric acid. Thus, the sulfur compounds in vog will irritate the eyes, throat and lungs, because these are always moist and in contact with air. For people with asthma or other respiratory ailments, the effects of SO2 and other sulfur compounds are more than irritating, and can even be deadly, because they act as strong triggers for airway spasms (constriction) of the bronchial system. In severely asthmatic individuals, exposure to SO2 can generate such a strong reaction that the individual can no longer breathe without immediate medication to re-open their airways. Hence, it’s extremely important that, if there is any chance of SO2 exposure to those individuals, both protective devices and medication to counteract the asthmatic response should be readily available at all times. Even then, it’s wisest to avoid, or leave, areas that are reasonably likely to be impacted by vog in the near future.